In this series of penetrating and attractively readable essays, Stefan Collini explores aspects of the literary and intellectual culture of Britain from the early twentieth century to the present. 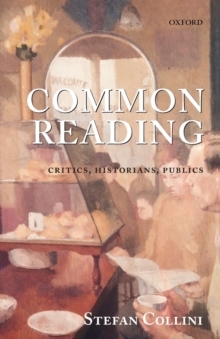 Collini focuses on critics and historians who wrote for a non-specialist readership, and on the periodicals and other genres through which they attempted to reach that readership. Among the critics discussed are Cyril Connolly, V.S. Pritchett, Aldous Huxley, Rebecca West, Edmund Wilson, and George Orwell, while the historians include A.L. Rowse, Arthur Bryant, E.H. Carr, and E.P. Thompson. There are also essays on wider themes such as the fate of 'general' periodicals, the history of reading, the role of criticism, changing conceptions of 'culture', the limitations of biography, and the functions of universities. Explicitly addressed to 'the non-specialist reader', theseessays make some of the fruits of detailed scholarly research in various fields available to a wider audience in a succinct and elegant manner. Stefan Collini has been acclaimed as one of the most brilliant essayists of our time, and this collection shows him at his subtle, perceptive, and trenchant best. The book will appeal to (and delight) readers interested in literature, history, and contemporary cultural debate.